This NYTimes article discusses ideas similar to the ones in my BGA 2012 talk (slides): because of previous selection (e.g., over the last millions of years of hominid development), most rare alleles affecting intelligence will have slightly negative effect. That is, the alleles of large, positive effect (to be precise: on fitness) will be found in every "normal" person, whereas alleles of small negative effect will still linger at low frequency. Being smarter is a consequence of having fewer of these rare deleterious variants. NYTimes: Few of us are as smart as we’d like to be. You’re sharper than Jim (maybe) but dull next to Jane. Human intelligence varies. And this matters, because smarter people generally earn more money, enjoy better health, raise smarter children, feel happier and, just to rub it in, live longer as well. But where does intelligence come from? How is it built? Researchers have tried hard to find the answer in our genes. ... Kevin Mitchell, a developmental neurogeneticist at Trinity College Dublin, thinks the latter. In an essay he published in July on his blog, Wiring the Brain, Dr. Mitchell proposed that instead of thinking about the genetics of intelligence, we should be trying to parse “the genetics of stupidity,” as his title put it. We should look not for genetic dynamics that build intelligence but for those that erode it. The premise for this argument is that once natural selection generated the set of genes that build our big, smart human brains, those genes became “fixed” in the human population; virtually everyone receives the same set, and precious few variants affect intelligence. This could account for the researchers’ failure to find many variants of measurable effect. But in some other genetic realms we do differ widely, for example, mutational load — the number of mutations we carry. This tends to run in families, which means some of us generate and retain more mutations than others do. Among our 23,000 genes, you may carry 500 mutations while I carry 1,000. I have to disagree with your premise that hominids were under selection for intelligence for millions of years. For about 99.8% of the time since our first hominid ancestors left Africa, intelligence was not a survival trait. You don't need intelligence to excel at being a hunter-gatherer. It helps having low reaction time and good memory, and there was selection along those lines, but they aren't the same as intelligence. Intelligence as we understand it involves capacity for abstract thought and manipulation of symbols. It became somewhat useful at the onset of civilization, and became strongly selected for with the rise of literacy and numeracy. This is why we see differences in mean IQs between branches of the same ethnic groups up to 1 sigma depending on their recent history. 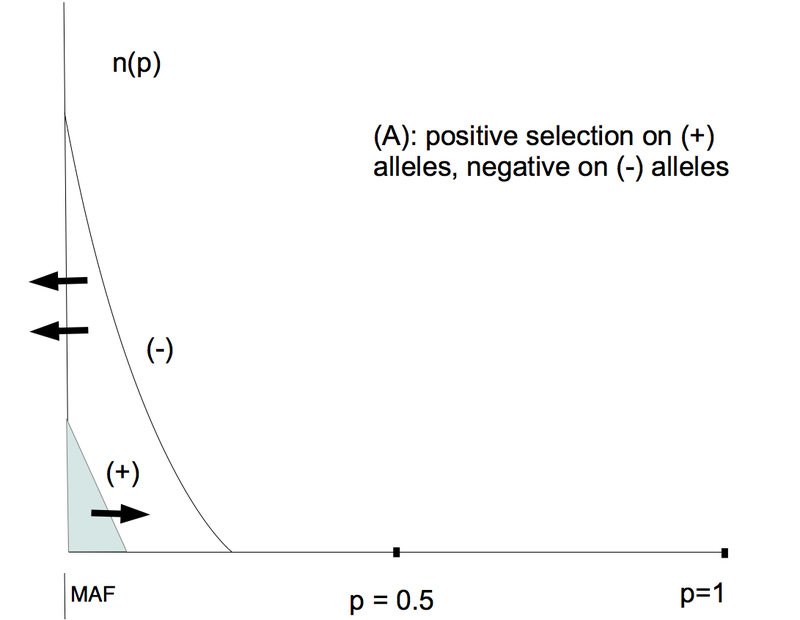 More generally, traits can't remain heritable under selection indefinitely (Fisher's theorem of natural selection). If it were true that humans had O(1000) negative alleles for intelligence, which were mostly heritable (not novel mutations), and 1 sigma corresponded to O(30), this number would be going down by O(30) every 50 years or so as long as intelligence was under selection, until we arrive at the point where most negative alleles are novel mutations. And if we were at that point already, we'd be seeing that, not only intelligence wouldn't be heritable, but we'd see strong "inverse Flynn effect", with each successive generation less intelligent on average that the previous one (as recent mutations accumulated over time). Since we see intelligence as heritable, it follows that it did not have time to saturate in the population, because selection for intelligence only began relatively recently and has since ceased. "going down by O(30) every 50 years or so as long as intelligence was under selection"
You seem to be making strong assumptions about the strength (rate) of selection. If our ancestors 500k years ago were on average -3 SD relative to modern humans they would have 1100 vs 1000 (-) alleles and perhaps it took 500k to reduce the average number of (-) alleles by that 100. You can go both ways. If it takes 500k years (2,500 generations) to go +3 SD on the trait X, it means that the selective advantage of X is vanishingly small (survival advantage on the order of 0.1% for 1-sigma difference.) An effect this small will be swamped by recent mutations, genetic drift, other traits influenced by the same genes that influence X, even traits influenced by nearby genes. 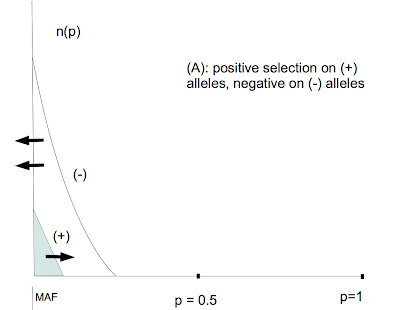 Selection pressure has to both remove de novo mutations and improve average genotype. So the rate we are talking about is net of de novo mutations. I think you should probably quit now. Still haven't seen the paper. 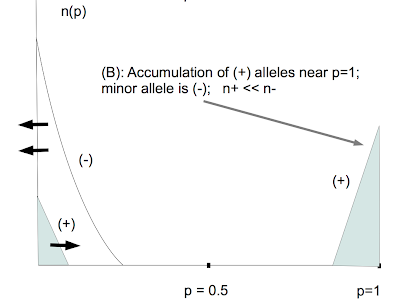 What constitutes significance varies with an allele's frequency. My guess is the analysis has screwed up here. "But where does intelligence come from? How is it built? Researchers have tried hard to find the answer in our genes"
"Intelligence" is a word not a thing. It is "operationalized" with IQ tests. There is no better way to operationalize it. Yet IQ tests for Danes have ZERO validity for people walking around the Kalahari naked let a lone Neanderthalas who couldn't speak and ate nothing but meat. IQ tests have ZERO heritability for the most destitute in the rich world (Steve has a post on this phenomenon). 1. Intelligence can only be assessed within a society and relative to the other members of that society. The intelligence test must be fitted to the society. 2. The g measured/estimated by IQ tests used in the US, Denmark, etc. may not be the same as such tests fitted to the Hottentots or black Americans living in public housing projects. Put another way: intelligence when operationalized is merely how well one is or has adapted to the demands and expectations of his society. Look at it this way. Yes, the selective advantage should be a bit higher to remove de novo mutations. But we're still talking about differences in survival rates between a "smart" hunter-gatherer and a "stupid" hunter-gatherer on the order of fractions of one percent. Which is the same as admitting that intelligence was almost irrelevant for most of those 500ky. Therefore there's no reason to presume that the selection pressure towards higher intelligence was there at all. And if the pressure wasn't there or it was so weak, there's no foundation for the next claim, that you can't have rare positive alleles affecting intelligence.
" almost irrelevant for most of those 500ky." "Therefore there's no reason to presume that the selection pressure towards higher intelligence was there at all." Except that it is very plausible that we are much smarter than our hominid ancestors. Or perhaps you are a creationist? If we are talking in 1E06 timescales, is it possible to assign meaningful estimates to the average IQ of non-human primates? It seems like doing so would add to the conversation about how much intelligence is selected for and how large the effect has been (can we use current primate intelligence as an approximation of hominid IQ at the time of differentiation? at what rate has primate intelligence changed over the last 500k years? Why has it apparently been selected for much less than in humans?). Regarding the 30SD idea, is there any reason to dis/believe the possibility of saturation effects limiting this? On another note, Steve, can you offer any more status information for the BGI study? Based on your last update there should be significant activity right now. So Steve, you hold out no hope of finding any IQ turbo or blower variants? Is it time to throw out that BGI IQ study data and look at the other tail? If there is only a bunch of within spec but less than optimum part combinations giving us that variation it seems like a lot harder problem to fix. It would be nice to think that there is a big cam, turbo, or blower out there in that BGI data to be found. I wonder what the relative balance of genetic and environmental effects is in the two tails. I suspect the lower tail has a larger environmental component, but this is purely speculation. Have there been any studies about this? Has anyone considered the possibility that there are alleles of potentially large positive effect that also increase environmental sensitivity (e.g. require an abnormally high intake of omega 3 fatty acids)? It might be hard to detect these (or, perhaps more accurately, to judge the effect size) in a population with a limited proportion of people meeting the environmental requirements. A citation from that paper looks interesting in this regard, but I was unable to find a copy in a quick search: Hashemi, R. R.; Pearce, B. A.; Hinson, W. G.; Paule, M. G.; Young, J. F.: IQ estimation of monkeys based on human data using rough sets. Proceed. 3rd Intl. Wrkshp. Rough Sets Soft Comp. 400–407; 1994.
the I knew the rest was not worth reading. Who is "we"? And the rest, "involves capacity for..." blah blah blah. No. "intelligence" is used an many ways. It's best operationalization is a battery of tests and the g score or mean score of these tests for the testee. Steve should have quit a long time ago. Steve again shows himself to be mentally handicapped. "...we are much smarter than our hominid ancestors"
And "we" are "much smarter" in the same sense that Feynman (IQ = 120) was much smarter than Stig Tofting (I presume)? And "we" at the beginning of the 21st c. are much smarter than our earlier 20th c. ancestors? Really? Richard (I guess a typical MIT admit? ), speaking of the IQ of anyone who doesn't live in the rich world of the last 150 years is like speaking of bicycles for fish. Your digging yourself deeper into the stupid hole. Your stupid hole comment would be more compelling sans grammatical error. We can argue about whether or not IQ is a reasonable proxy for intelligence (I understand it has weaknesses). I choose to use it in these conversations because it is the best quantifiable proxy of which I am aware. If you have a better one please enlighten me. Do you disagree that non-human primates possess intelligence? I think it is fair to assert this along with the belief that human intelligence has increased since the point of divergence with the other primates. An attempt to quantify this is only a model (and a fairly crude one at that IMHO, I think one of the biggest problems is what kind of scale to use, e.g. linear vs. logarithmic) but it is the best way I see to attempt to quantify the results of selection pressure on human intelligence. Please enlighten me as to what exactly is stupid about this point of view. We need solid estimates for the hereditary nature of Intelligence. I'm following this blog because it provided the best estimate, but the studies were criticized for failure to separate nature from nurture. Smart people raise smart kids, as well as breed them. It is perhaps a mistake to describe mutations as simply beneficial or deleterious. Just as we presume that hip size is a limit on head size, mutations for larger heads mean bigger brains and more birth problems. It is possible other mutations are double edged. We know that for recessive genes such mutations can survive and prosper under the appropriate selective pressures (Sickle Cell). I suspect it is equally true of genes affecting intelligence, anecdote holds genius and madness are close cousins and I know people in whom this is true (even if they don't represent a large proportion of the intelligent people I know). Minor nit-pick but intelligence has increased since divergence from other EXTANT primate species. It is a subtly different claim, but leaves open the question of the intelligence of other extinct hominids. I suspect we underestimate other apes still, one of the gorillas in the zoo is keeping a keen eye on me, that he gets free food and so lazes around all day shouldn't been taken as too much indication of his IQ, I'd probably do that too if I got free food and regular mates brought in. Good point. Thanks for the clarification. I wonder if at some point we will be able to make a good intelligence estimate for extinct hominids (perhaps a combination of physical and genetic measurements)? Seems unlikely, but I have learned not to be quick to claim impossibility. A lot of people seem actually to believe these things. I share your astonishment at them. There are some analogies between animal and human intelligence, but even in the great apes, not nearly enough to profitably compare their development, let alone measure it on the same scale. There is some suggestion that Neanderthals (I'll leave the debate as to if they are a separate species) had larger brain capacity, tool use, language, art, musical instruments etc. So I think can safely be placed on a comparable level with Cro-magnon, and may have been smarter than us. MtMoru is a retard, but he makes the point above that IQ is the best "proxy" for intellegince when comparing one human to another within the same culture/society/class and that "proxy" isn't the right word. Yes, there is a sense in which humans are smarter than other primates, but what is this sense exactly? It isn't the IQ sense. One word may have many senses, all related of course, but distinct in significant ways. The IQ of any animal or group of people can be measured as long as there is some g to all subtests. But the subtests must differ as must the g even with the same subtests from one group to another. IQ is the measure. IQ cannot be estimated. No! Don't say that! It isn't true: Genius and madness are NOT close cousins. We are merely misunderstood, become impatient, and disaffected, nonplussed and even disenfranchised. Thus, some feel unhappy. Unhappiness negatively impacts sociality. There be psychiatric pathologies. Okay, I have returned. Calmly. Your comment is valid, insofar as your observations of reality are accurate (says me, with similar opinions and nary a shred of confirmation bias ;o) Seriously, I don't know if it is possible to estimate the hereditary nature of intelligence. I'll attempt to be constructive: There are tests administered to very young children in order to determine whether they have Down's Syndrome or other conditions that result in adult mental handicaps. I don't know if those tests are solely neurological, whether they gauge language skills, nor at what age they are valid. I'd look into that for insight about the effect of nature versus nurture on intelligence, especially if we are concentrating on the "other tail", as Steve's post and the NY Times does. The testing for Down's syndrome is multifaceted, Fetal screening include hormone test and nuchal fold ultrasound. Interesting, in the light of the latest post, that a SNP responsible for relatively low level protein binding is the most prominent in IQ. I suspect what it is telling us is that you need to be "well formed" in many ways to display intelligence. No good being super smart if you have infections every time they test you. But Down's is such a marked defect I'm not sure it will provide much generally useful information about IQ, in that many systems malfunction due to the chromosome anomaly. Probably the thing to say is that being free from many common defects helps people display intelligence, so it is more noteworthy if someone otherwise extremely intelligence displays a significant defect in a particular area. The evidence is mixed even for affective disorders and creativity. I guess perhaps one of those areas where we recognize flawed genius but it is hard to define.